If you try and test too many software's, it's most probable that your Windows operating system will get much of the non useful left-over information, registry keys, empty folders and files, shortcuts and many other such things resulting in an overall performance lag of your computer. This Uninstaller work wisely and remove all the data like empty folders, left over files of the software, broken shortcuts, registry entries and all other things. Just select the software from the list and click on the uninstall button. The best feature of Wise Program Uninstaller is 'Force Uninstall' which will help you if you are not able to delete software due to some system errors. 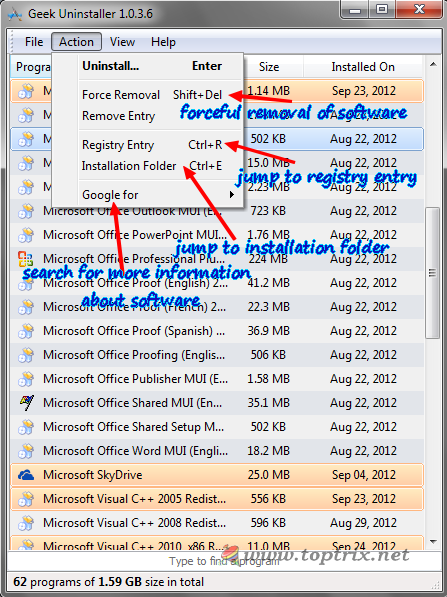 If some program is already uninstalled, you can delete the entry from here. It also has a option to repair software if some software is not working properly. The program list can be sorted as per name, size of the installation and date of installation. The un-installation tool is just 1.5MB and works without installation and can be used from portable USB drive. Geek Uninstaller is also a windows software un-installation utility that doesn't need installation and can be used as a portable application from USB drive. Geek Uninstaller has sleek interface and easy to use options. 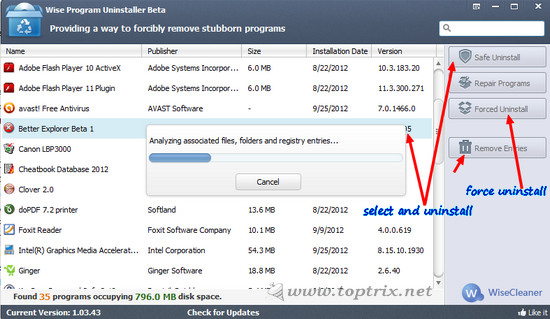 Just select the software from installing software's list and click on uninstall from the action menu. The special feature of Geek Unistaller is, you can directly jump to the registry entry of any installed software by selecting the software and click on 'Registry Entry' from the Action menu or alternatively press 'CTRL + R'. Same way you can also jump to the installation folder. You can also go to the software vendor's / developer's website from Geek Uninstaller. The installed program list can be sorted as per name, size and date of installation. You can export the software list to external HTML file for future reference.